If you don't know I'm a fiend for tea... well, there's a long road ahead of you. I can't drink coffee because it gives me headaches and upset stomach, so I went for tea when I needed a caffeine boost. I ended up actually enjoying it and the different varieties thereof, which is fortunate since my other option makes me feel pukey. When I was up in Illinois visiting Ginger, we stopped by DAVIDsTEA, a chain that specializes in loose tea and accessories. I was unfamiliar with the brand, but there was a sale on, so I figured I'd have a nose around. In particular, there was a tea Advent calendar, consisting of tiny sachets of loose tea in a decorative box. This is exactly my thing, and I figured I'd give it a go. For what it's worth, I have a bias. I am used to Discover Teas, a locally-owned company that specializes in all-natural blends. If there's chocolate flavor in the tea, it will be cacao nibs. There's nothing powdered or artificial mixed in with the leaves. Some people may appreciate this from a health standpoint, but I personally prefer it for two reasons. One, artificial flavors don't always steep consistently, and can leave weird textures or flavors. Two, they tend to not survive to the second steep, meaning that if they were heavily responsible for the flavor of the blend, you don't get as much staying power out of your tea. And for someone like me, who dumps leaves in a French press and refills as needed throughout the day, the ability to have a second steep is essential. DAVIDsTEA made no secret of knowing this was their star player: my purchase included a postcard featuring a recipe for a latte using this tea. It has mar-bits, cinnamon, sugar, and other things directly in it, which was almost a turn-off for me (for the reasons above). But in this case, the balance was such that the flavor was actually quite good. This didn't seem to be off-the-block pu'erh (for those who don't know, that's the really strong aged stuff you shave off compressed blocks and that can be steeped about 5 times before you lose significant flavor). I didn't need it to be, but it's worth noting that it's sold loose. It didn't have the same heavy, aged flavor as the pu'erh I'm used to. But it was strong enough that it suited my preference for super-strong black tea. I never did try it according to the recipe card, but it was fine as it was. As with the s'mores chai, this doesn't seem to be traditional pu'erh so much as Very Strong Black Tea. It pulled its weight, though, this time with orange bits in it. I'm still not a fan of the artificial flavoring in it, but it survived a lot better than I suspected it would. I wanted tea that tasted like a chocolate orange, and I got it. I also got a decent second steep out of it. I'm a sucker for red velvet anything, and this fortunately turned out as well as I'd hoped. The chocolate ended up being fairly light-touch, and even though the sugar included was a bit more than I'd have preferred, it still turned out to match the flavor I was after. This one had a leg up over most of their black teas in that, like the pu'erh, it had a decent amount of flavor and staying power to it. The box had a fairly wide span of teas available, covering all their different categories. The good news was that this gave me a diverse sampling of their offerings. The less good news, I'll cover in a moment. DAVIDsTEA's strongest offerings, at least to me, are their greens and oolongs. 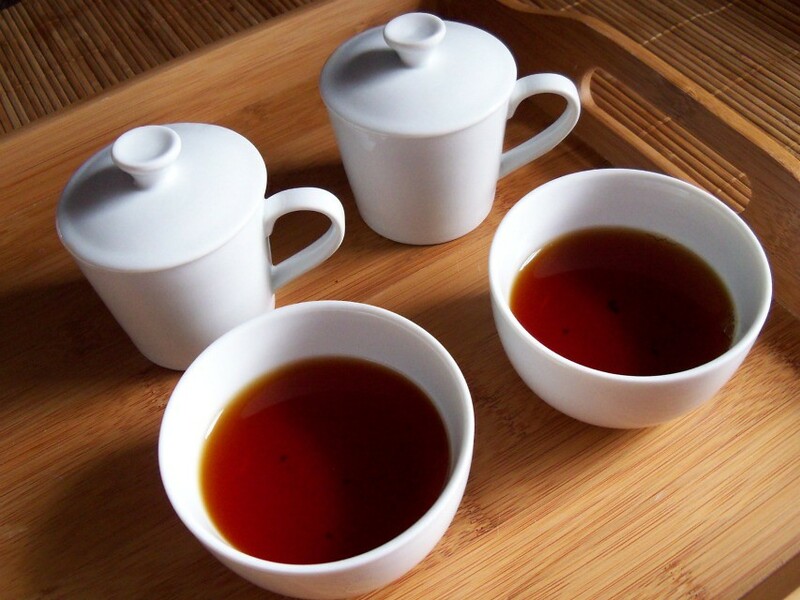 Their black tea is hit-or-miss, sometimes being great and sometimes brewing up strangely weak (even for someone like me, who brews extra-long and loves those tannins). Especially strong are the straight-up greens and oolongs, rather than the flavored ones. Sadly, they lost me with their tisanes. The main reason was apples. The down side of sampling a new tea every day is that, if multiple teas in their line are relatively similar, it's going to to show a lot more. Their fruit teas, at least the ones included, had an almost exclusively apple base. I like apple stuff, including apple tisanes, but knowing I had anywhere from half a dozen to a dozen variants on apple tea in a variety pack didn't make me terribly enthused. The fruit and herbal teas were fine, and honestly had more staying power for re-steeps than their black teas. And I'll likely buy one. But in a variety pack, it killed the variety for a good percentage of it. I hate mentioning full negatives on anything, but it bears mentioning that the Fireside Mocha did not agree with me at all and gave me something of an upset stomach. This could well have been a personal issue with one or more of the ingredients, though. It had a very heavy coffee flavor to it, which may fall under the "natural flavorings" listed. I don't believe it was that (I have had tea that actually includes a dash of actual coffee before), but I could be wrong. Check the ingredient listing first. I'm hoping this was just a personal issue but it pays to be careful. I love the idea of a tea Advent calendar. It's fun to wake up and have someone else choose the day's brew for you and know you're going to get something different each day. I found at least three things I enjoyed enough to buy again out of the 24. I wish there had been a more tailored experience available, while acknowledging that it probably wouldn't have been cost-effective to make two or three variants. I probably would not buy an Advent calendar from them again next year, knowing the risk of sameyness when it comes to the tisanes; but I would absolutely get a black/green/oolong sampler from them done in a similar style. If you have little to no experience with tea and just want to start playing, this might be a good purchase for you next year. But if you really know what you like and have very specific tastes, you might end up with a handful of things you like and a backlog of things you're passive about.